Well paired with Proske’s Lucia, Ethan Heard’s direction of Dido and Aeneas is similarly intelligent, emotional, and efficient. Doubling as supporting roles and ensemble, the cast moves the narrative along with infectious, drunken spontaneity. 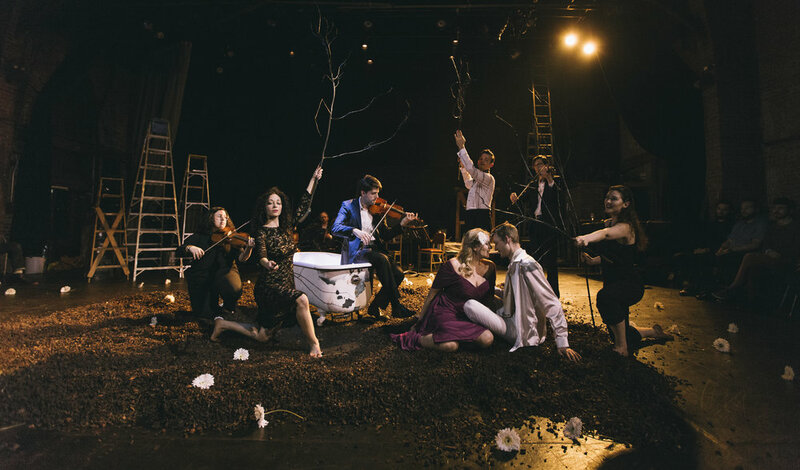 Of special note, Christopher Preston Thompson, as the Sorceress, injects the proceedings with a queer streak of anarchy; and, in the role of Aeneas, John Taylor Ward offers an arch, self-aware characterization. The only figure to stand apart from this mayhem is Carla Jablonski as the regal, pathetic Dido, around whom the mischievous machinations swirl. 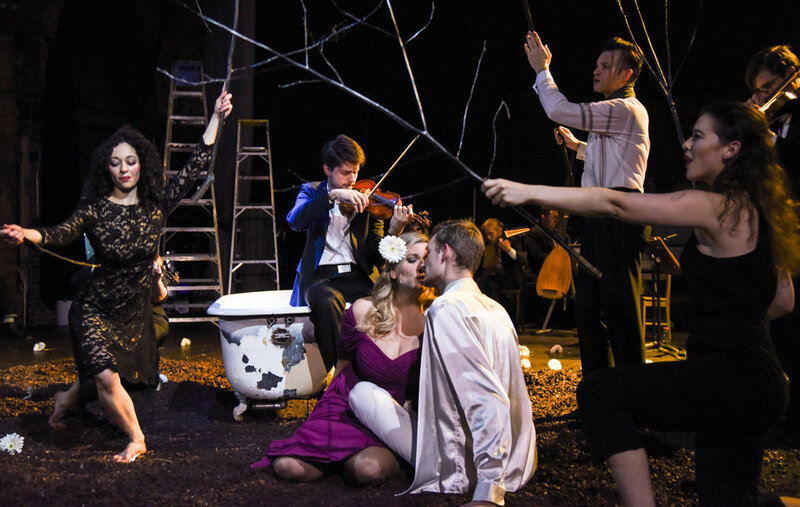 Jablonski’s Dido is deeply felt and well sung—handsome, tasteful, and majestic. As much as the singers and musicians in both Proske’s Lucia and Heard’s Dido contribute to the overall success of the double bill, the essential reason to see both operas lies with the staging. Heard and Proske are a pair of auteurs to watch for. Their intelligence and warmth saturate the respective works, making for a thoroughly enjoyable evening at the opera house. Thompson made an arresting entrance, stripping down to a white shirt over torn black fishnet stockings, donning high ­heels, and applying dark red lipstick to become a transgender Sorceress. Marquis sang an especially fresh and candid Belinda and First Witch, ably abetted by Slate as the Second Witch and the Second Woman. 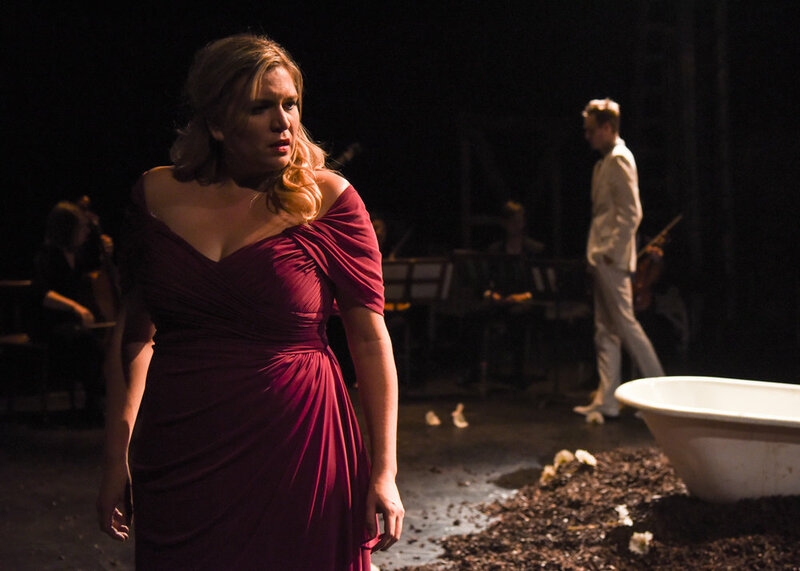 Ward’s warm bass beautifully conveyed Aeneas’s anguish as he reluctantly abandons Dido, and Jablonski performed a searing and intimate final lament.